Dogs and cats, had an important presence in the Egyptian civilization, Anubis, the God of the dead, has not been determined if it was a dog or a Jackal, although both are related but some archaeologists have adopted the version that was represented by a dog, although many Egyptology are convinced that Anubis was a Jackal, or Wolf. Another God represented by a dog was worshiped in the city of Abydos call Khentementin; in Assiut on the other hand, had a dios-chacal, Wepwawet. Undoubtedly in the old Egypt, the dogs had certain fondness with everything related to deceased, believed that it was by the habit of dogs wander at night in cemeteries. Towards the end of the dynasty V the prestige of Anubis decreases in the burial area, probably by increasing prestige of Osiris that overshadows Anubis, although of course by the conservative characteristic of this civilization this preponderance of one God on others leads several dynasties. It should be noted that, before Anubis, perhaps previous to 4,200 years b.c. in the high Egypt another dog had already met the praise as a God, this was Seth, the Hound of coiled tail. 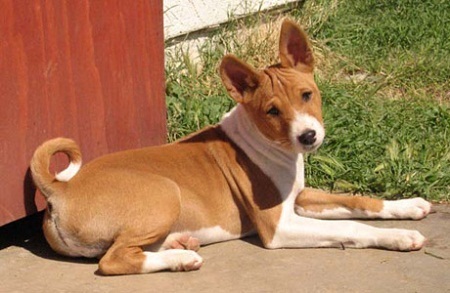 In Egypt there were four breeds of dogs: a hound of Dalmatia of Nubian origin, used in the hunt for the Gazelle, a type dingo, a molossus and a dog Save not very big which is characterized by having short legs, this was a very strange dog, since his chest seemed to touch the ground. The best-known high Empire dog is a hound’s long legs and long tail, quite large, sometimes erect ears and other falls. In the period preceding the invasion of the Hyksos, they brought molossians known as Mesopotamian Mastiff or Assyrians once freed from this invasion Egypt preserved has been represented this breed of dog, warriors and powerful animals that became excellent auxiliary of the Egyptian combatants, in paintings running next to the cars and ending the enemies fleeing. The young Tutankhamun did paint a scene (see image) where was it seen chasing the Nubians with these dogs, he shoots arrows on these warriors while they are attacked to bites by the molossians Assyrians of coat color cream and had impressive collars with metal spikes. Molossians or greyhounds, dogs in Egypt were respected and it was forbidden to kill them and condemning this attitude with the death penalty and the mistreatment of animals are penaba with corporal punishment, archaeologists have found them mummified at the grave of his master who had a great affection for their dogs as not they were sacrificed at the time of his death but they were mummified (see image) and deposited near the Tomb a time that cease to exist by natural death, cried them and was mourning in his honor as much as his master. Although the cat was also highly respected and protected in 1500 BC it seems that the dog takes a slight advantage on the feline and sent emissaries to distant areas in order to bring greyhounds more agile and harmonious to the complacency of the Pharaohs.